CBS Sunday Morning this past Sunday told the story of hugely successful art forger, Ken Perenyl. It appears that Perenyl has had an immensely lucrative career as a forger of the works of a number of mainly eighteenth and nineteenth century artists. He boastfully demonstrates his techniques for aging canvas and frames. Perenyl goes on to show the evidence of where Southby’s sold one of his forgeries for $650,000. Ken Perenyl has never come close to paying for the crime of forgery and deception even though the FBI did sniff around a bit at one time. Watching this left me feeling torn between admiration of his skill and disgust at his gleeful attitude toward his crimes. Grossman LLP is a law firm that deals with issues in the art world. On the firm’s blog, Art-law-blog, is a recounting of the case of the owner of the New York art gallery of Salander-O’Reilly. Owner Salander was convicted of crimes of deception in the art world. He was driven into bankruptcy and is paying the price of his shady dealings. Yet Perenyl not only walks free, he brags about his crimes. 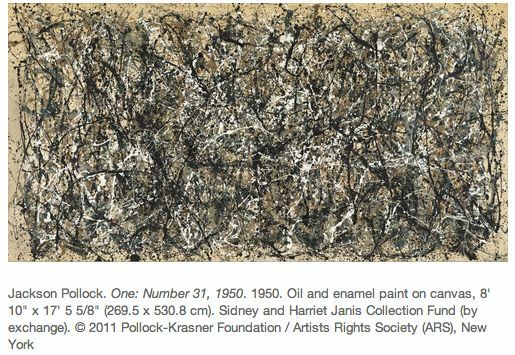 If we take Jackson Pollock’s quote as truth, what does that make Ken Perenyl? And why should we care? What effect if any, does this forger have on the majority of honest artists out there? This entry was posted in Uncategorized and tagged Art, Art world, Crime, Forgery, Jackson Pollock, New York. Bookmark the permalink. What does that say about the heart of the forger? Interestingly can you have a fake heart? Great question! I’d say it says a lot about the his heart. Fake heart sounds like an apt description! Perhaps he’s simply not a good artist. A good forger, sure, which takes considerable skill. But not an artist. Is forgery an art? I think it can be. Arthur Philips’ novel “The Tragedy of Arthur” has a character who makes a career of forgery, and may or may not have forged an entire Shakespeare play. It was, however, an original creation. This Perenyl guy just copies, which, although instructional, isn’t really art. It isn’t a true expression. Yes. His are not creations I think you are right that he has perfected a skill but it is still copying. He at least now publishes that they are copies. He sold many as if they were the real thing to many unsuspecting patrons and galleries before finally coming clean. I can admire his skill but am still left feeling a sense of disgust. Hmm . . . lots of interesting questions here – mostly without answers, I suspect. But certainly we are all allowed our opinions – I think I go along with the, skilful but not brave enough to be creative, opinion. I wonder what art he could have made had he been brave enough? You are right, he is certainly very skillful.